What we do not have are the things that we do not really want to have. What we often obey are our goals and needs. If you really want to win in poker games, you will let Piatnik Star Club marked cards to help you. Piatnik brand is made in Austria and Club Star is one kind of Piatnik poker cards, it is also a kind of playing cards with poker size jumbo index. Piatnik Star Club marked cards are the cards marked with invisible ink on the back, and those marks we made can be seen only when wearing our infrared contact lenses. 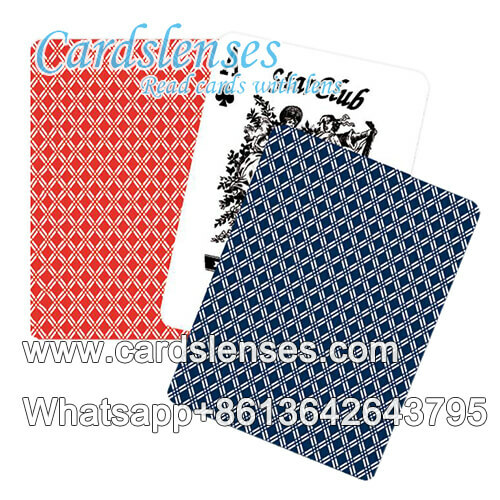 We also sell the invisible ink and the pen to mark the cards, you can mark the cards yourself, but the effects of the marks made by hands is not so good as made by printer, and sometimes the marks can be seen by naked eyes. Therefore, if you need marked cards, you had better let us know your requirements about the marks, we can produce the best marked cards for you. Furthermore, do not forget to buy our infrared contact lenses at the same time, for invisible marks we made on Piatnik Star Club can not be detected by other contact lenses.